This 8 mile round trip out & back is extra nice because you get to be IN a National Park while hiking ON the Appalachian Trail. The AT is not a National PARK but it is a National Scenic Trail so it’s a little like killing two birds with one stone. Plus, the hike has plentiful overlooks and viewpoints, is relatively flat (~1200 elevation gain over 4 miles) and has easy parking/accessibility. This hike starts from Newfound Gap at the North Carolina & Tennessee State line on US Highway 441. This public road runs through the National Park and is part of the reason why entrance to the park is free. The parking lot at Newfound Gap is pretty huge and often bustling. Many tourists hop out to take in the view or possibly use the restrooms. Many of them will look at the trailhead sign and chuckle about how far away the end of the Appalachian Trail is but very few will venture more than a quarter mile away from the parking lot. Your job is to go past that sign and keep hiking. Charlie’s Bunion is a rocky lookout point just over 4 miles in on the trail. 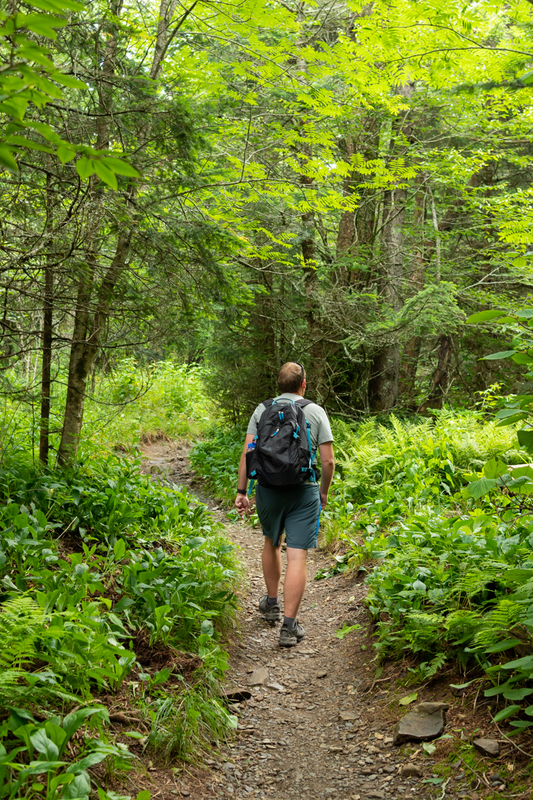 You’ll pass two trail junctions and at each one, stay on the white blazed Appalachian Trail. The first intersection is at 1.7 miles with Sweat Heifer Creek Trail. You’ll climb slowly but just about the whole way up to this intersection. There’s a nice view a hundred or so yards down this trail but you may have already snuck one in recently. After Sweat Heifer, you have about a mile until the intersection with Boulevard Trail. If you’re up for a truly epic day, turn left on Boulevard to head over to Mount LeConte. If you know 8 miles is easily in your wheelhouse, another option at this junction is to head up to the Jumpinoff Trail. We just did this hike for the first time this past weekend. And it was tougher than we expected. So my recommendation would be to take it on the way back once you know you’ve made it out and back from your primary goal and are still ready for more. After Boulevard, it’s mostly downhill for 1.3 miles. You’ll pass Icewater Springs Shelter on your right about 1 mile from Charlie’s Bunion. This shelter is one of the classic AT shelters through the Smokies. It has a lovely view from the shelter area and makes either a nice resting point or a nice stopping point if you want to make the hike more like 6 miles instead of 8. If you do continue on to Charlie’s Bunion, you’ll hopefully be rewarded with sweeping open views and maybe some classic Smokies fog lingering in the valley. The views stretch for miles in many directions. Mount LeConte looms in the distance and you can barely see civilization. We’ve done this hike in winter, spring, summer, and fall, in snow and rain, on clear days and rainy days. The long-distance views aren’t always spectacular (like during thick fog) but even then, the rock formations feel extra cozy and dramatic. The hike back from the viewpoint is slightly easier than the way out. After the first climb up past Icewater Springs, it’s relatively level terrain until you pass the Sweat Heifer trailhead and then you’re mostly going downhill. The trail is fairy wide but has its share of roots and rocks so make sure to pay attention to your footing. Especially on the way back, you might find your feet dragging a bit more.